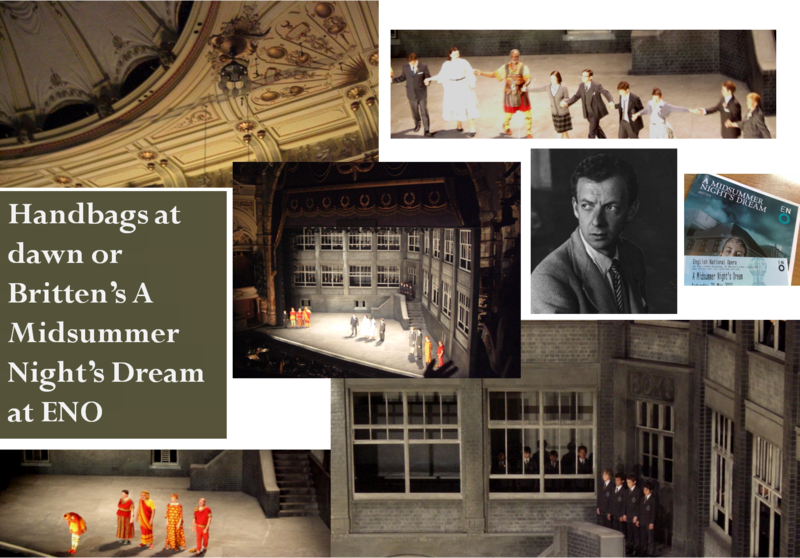 I have to confess at being a total Britten virgin and this time round I went to see the new production of A Midsummer Night’s Dream at the English National Opera on a whim (only bought the tickets the day before the opening). While following all the reactions of bloggers and critics on Twitter I was fascinated by the genuine dialogue it was creating. Lets say there was a buzz in the air. It was a shame to hear that Iestyn Davies was vocally indisposed and he was only acting the part while a stand in was singing from the side of the stage (he was absolutely fantastic as Creonte in Steffani’s Niobe Regina di Tebe which was on last year at Covent Garden) but the other main reason for seeing it was my total inexperience with Britten’s operatic output. I systematically had avoided his work as it seemed to lack passion and any compositional radicalism. Reading numerous reviews the day after the first performance I was intrigued by the division between the reviewers into the offended old crowd that thought the family silver had been pilfered and a much younger group that thought it was as exciting, if not even more, than Faust that preceded the production at the Coliseum. A particular example that created an avalanche of Tweets was Stephen Jay-Taylor’s “review” that had all the qualities of a gossip session over the garden fence. He has been writing for aeons but that fact does not give him a carte blanche to insult performers in order to please his enlarged sense of self. Having seen the production this evening I can say that I am terribly surprised that such irresponsible rubbish has been written about it. Why is Britten’s work seen as the sacred cow of British operatic tradition? Himself partially used Shakespeare’s play and wasn’t too bothered with authenticity, why does a change of context create such an amount of discomfort and apparent sense of threat? Christopher Alden did give us a very uneasy ride by siting the action in front of a forbidding Victorian school all painted grey(a nice touch was that the right hand side part of the set was jutting beyond the proscenium, agitating the space in the process). Surely we did not get the fantastical wood that Britten’s own provincial first production in 1960 has had. But Alden does make an interesting allusion to the composer’s personal life and his perception by the people around him. He creates an uncomfortable story of child abuse that is insinuated through the relationship of teacher Oberon and his chosen student. A clever reference to Britten’s obvious fascination with boys throughout his life and operatic career. Even though there is no evidence of any impropriety Alden is inviting us to look through the eyes of Britten’s contemporaries in 1960, while he was rehearsing the piece it must have seemed to a lot of people totally unnatural a mature man to cast a cornucopia of young boys in his latest opera and to have them rehearse in a barn in the middle of nowhere. That very core of his idea about the composer is what can be seen as gratuitous and an easy shot. But I can vouch that it actually works on stage. It brings Britten’s own demons to the fore with the cruel reality of school thrown in for good measure. The set is providing for hidden looks and touching between Oberon and his Changeling Boy, creating an intriguing mix of psychological terror and a tableaux of shadows that gets exploited in numerous ways. A very telling scene is in the second act when Oberon leaves behind Tytania who is smoking in a depressed state while he walks off stage with the boy. Till he reappears in 15-20 mins all sorts of ideas circle in the minds of the audience. Another creepy detail is when Oberon stops singing his aria out of the window of the classroom his “best boy” is helping him put his jacket on. And that is the way Alden’s sub plot is working, by suggestion. He has not gone for any coarse means but by association he leads his audiences mind to wonder into some very dark recesses. Now that is the kind of thinking process that would never take place had we had a pretty wood on stage. This kind of total rethink of the plot may seem an anathema to some purists but as a newcomer to Britten found it meaningful and an interesting diversion from a well trodden path, where staging an opera amounts to performance archaeology and nothing more. This darkness in setting and intentions has also another effect, it amplifies that almost film noir elements of the score. All the slightly dissonant keyboard playing and the haunting long phrasing of the strings seems dark and airless on top of a gleaming, textural couverture of pizzicati strings and bells. The third act brings a hilarious staging of the play within a play (Thisbe and Pyramus), the audience tonight found it very funny and there was a lot of laughing echoing in the auditorium, in contrast it seems to what a couple of spiteful reviewers were reporting from the première. Willard White was really going for broke and delivered some very funny moments and also an emotionally charged moment when he almost directed the school children / fairies to use the whole of the building as a giant drum kit in order to accompany their singing. Michael Colvin’s Flute (Thisbe) was really funny in pink tights and sang very well his “heroine’s” last moments. Anna Christy sang her torturous high coloratura with the frivolous outlook of a leggera soprano. Her singing was beautiful and being made to parade the stage in your bra while singing some killer aria is not an easy task. She gave us the frumpiest Tytania in the history of the stage but she had the stage presence to be a fantastic companion to Oberon. Iestyn Davies did actually sing tonight, his voice was as beautiful as ever but in the first couple of scenes he sounded guarded and seemed not to push too hard, his subdued instrument making his presence feel weak. But it’s totally understandable when he is not very well. After the interval he sounded much more comfortable and the volume increased too. Even for people that find counter tenors tedious I can imagine finding his attractive silver tinged delivery appealing. Two other definite stand outs where Allan Clayton (Lysander) and Kate Valentine (Helena), their duets where beautiful and with a very confident and assertive vocal positioning. All in all I am relieved to report that there was not a hint of boo from the audience. Everyone was appreciative of the great efforts from the choir, orchestra (under the vibrant baton of Leo Hussain) and soloists. Britten’s crystalline structures came through and the clarity of the playing was just a joy. I don’t think he will ever be my favourite composer but tonight was a great start of looking into more of his works in the coming seasons. One criticism I would have of this first outing of the production (as referred to by Alexandra Coghlan) was the profusion of wall touching…most of the characters spend inordinate amounts of time feeling the grey walls. An exaggeration that sometimes took us away from the moment. But that hopefully can be looked at and corrected and not seen as an Alden signature. I’m both a Britten and an Alden fan. A Midsummer Night’s Dream is one of my favourite operas. I saw Alden’s WNO staging of Turandot two weeks ago, which was outstanding. Musically, this ENO one was excellent. On this occasion, though, Alden doesn’t serve the opera, he uses Britten’s music and libretto to create his own. This isn’t Britten’s opera or Shakespeare’s story. It is profoundly disrespectful, contemptuous and arrogant for a director to do this to a dead composer who can’t answer back. It is the job of a director to serve the opera; if he doesn’t want to do that, he should write his own. Opera isn’t a museum and I approve of fresh approaches, but my acid test is ‘what would the composer think?’ . I think Handel would love Alden’s Partenope but Britten would hate this. As he can’t say it, I feel I have to! By the way, ENO’s last AMND was a wonderful fresh production that did serve the opera, so ditching that for this makes it even worse. I absolutely respect anyone that wants to be the moral protector of composers. And I can see why someone would like to do it against the background of capricious “regie” productions that have been sweeping operatic stages across Europe for a decade. They tend to be intrusive and quite frequently pointless. In this particular instance Alden’s change of the environs from beauticious Athens to Plastow comprehensive may be seen as capricious too. But honestly think it illuminates an underlying darkness that is part of the work. It is a dramatic and solemn setting for it. The fact it’s based on a Shakespearean play is of no interest to me. That’s the RSC’s business not the ENO’s. The ENO have succeeded in giving a dramatic new reading to what potentially can be a fussy period piece. One thing I’m happy about is all the discussion it has brought out and have read some very interesting discourses around contemporary opera productions. I’d rather have mature polemical conversations on that subject than another sleepwalking season like the current Royal Opera one with very little signs of life and bold decision making.